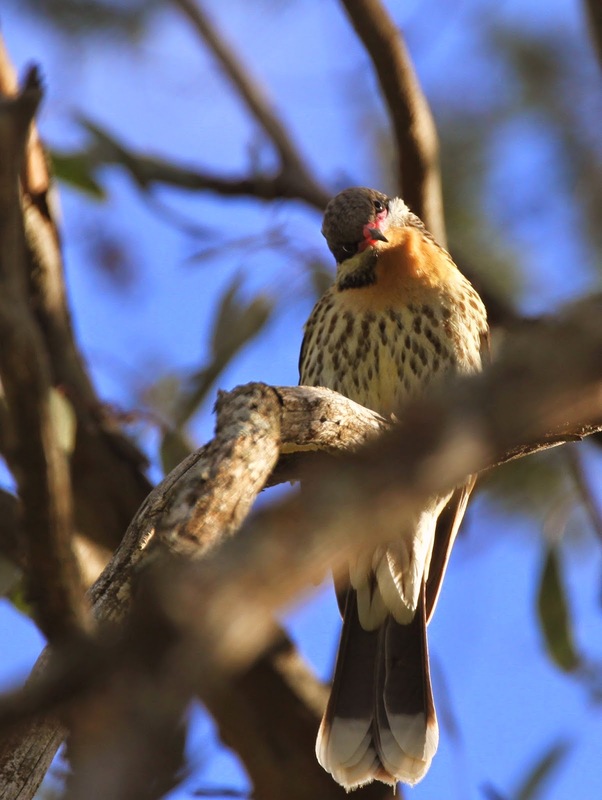 The following report covers some birdwatching locations in the Riverina, including Cocoparra National Park and Binya State Forest, Fivebough Wetland, Leeton and Tuckerbil Wetland, Pulletop Nature Reserve and Galore Hill Nature Reserve. I’ve visited most of these sites about half a dozen times, so this report is a bit of a rundown of those experiences, plus a bit of background knowledge thrown in. In 1817 John Oxley, the first Europeans to visit the region, wrote in his journal “the weather as usual fine and clear, which is the greatest comfort we enjoy in these deserts, abandoned as they seem to be by every living creature capable of getting out of them.” How wrong he was – from a birdwatching and wildlife point of view, the Riverina is a seriously under-estimated birding destination. By contrast with Oxley views, when early settler Henry Osborne climbed to the top of Galore Hill in 1847 he shouted “There’s land enough and galore for me”. Galore is an Irish word that means plenty. This was perhaps a bad omen in terms of the clearing of native vegetation, however it does show that the Riverina is an area of contrasts, certainly in terms of its habitats, and it appeals to different people. 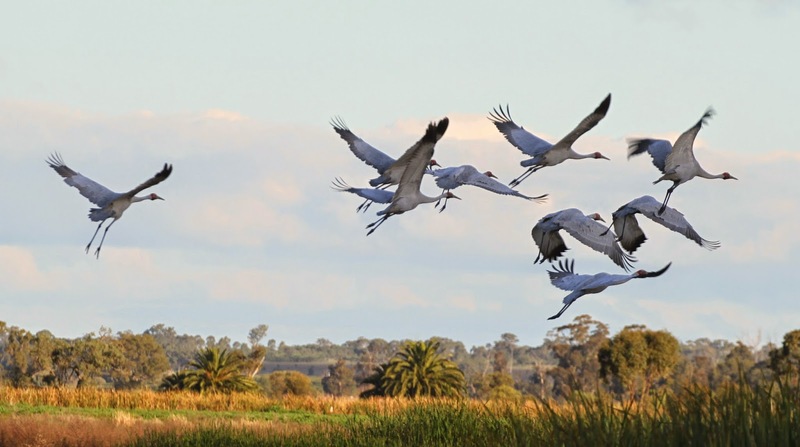 One reason I’ve written this report is because a lot of Australian birders travel to northern Victoria, visiting places such as Chiltern-Mt Pilot National Park and Barmah National Park but seem to stop at the Murray River. This may be because there’s relatively little information about bird sites just north of the Murray, so here’s my own personal rundown of these places. For a while the Riverina was a popular destination for birdwatchers, due mainly to the Australian Birdfair, which was held each year in Leeton. Fantastically organised by Mike Schultz, unfortunately this event hasn’t taken place since 2011, and a new Australian Bird Fair has started in Sydney’s Olympic Park. In many ways it’s a great shame, I attended the Leeton Birdfair in 2010 (or was it 2009?) and it was fabulous! There was a great program, it was organised by some great people, and it was in a great location. The Riverina is a also great stop over site, stop there when you’re heading to Round Hill Nature Reserve and Lake Cargelligo, stop there if you’re heading from Melbourne to Brisbane (and beyond) or vice versa, and stop there if you’re heading from Sydney to Adelaide or vice versa. The main site I want to concentrate on is Cocoparra National Park (8358 ha) and the adjacent Binya State Forest (4170 ha), mainly because they are both a rare woodland remnant, and they are a bit of a jewel in the Riverina crown. 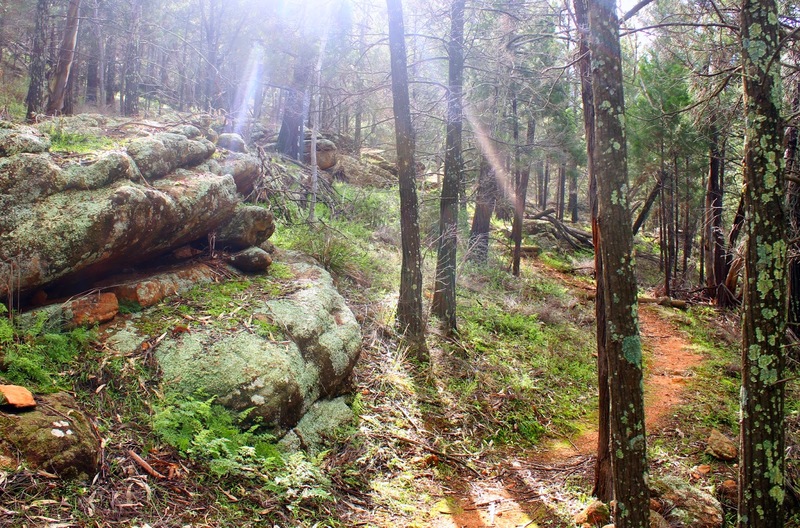 I’ve visited these parks a number of times; there’s some dramatic scenery, rocky outcrops and, in places, the rich red soils contrast wonderfully with the greens of the trees, particularly the native pines. 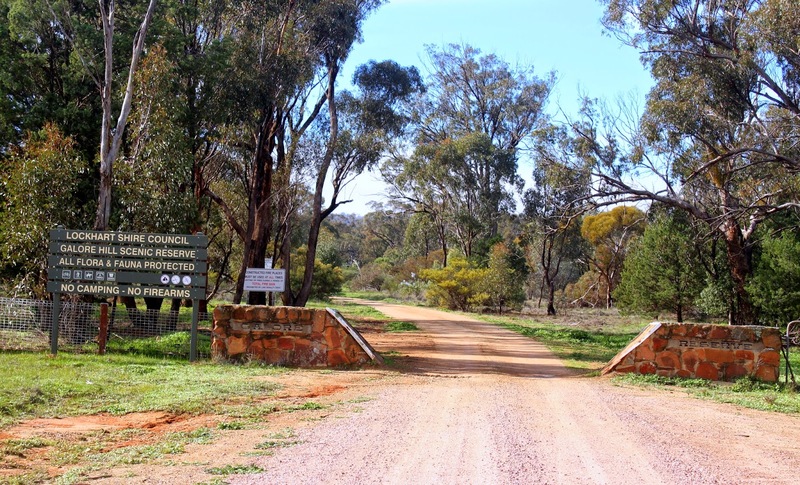 First gazetted as a national park in 1969, Cocoparra National Park is located 20 km east of Griffith on the Burley Griffin Way. When I’ve visited I’ve pitched a tent at the excellent Woolshed Flat camp ground, or visited from Leeton. 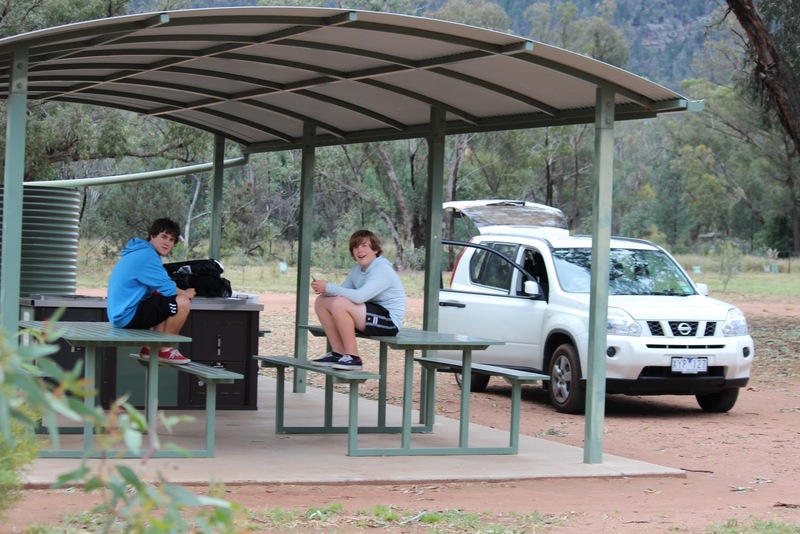 As with most national parks bush camping is also permitted away from roads and facilities. 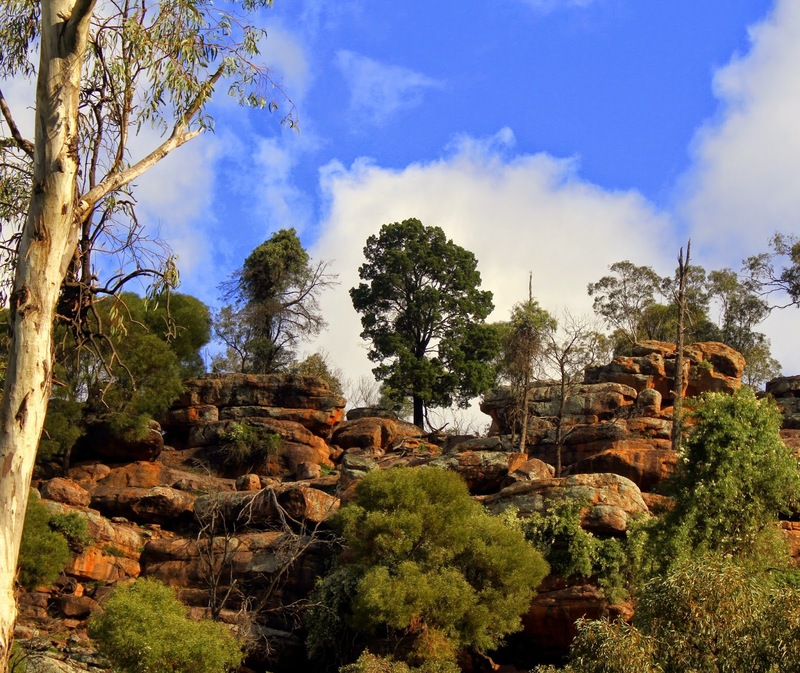 The Cocoparra Range is part of the traditional lands of the Wiradjuri nation, and there are ~60 known Aboriginal sites, mainly open campsites and scarred trees. Wattle Drive – note my parking style! Lesson 1: car parking technique for birdwatchers, follow these steps. See what you think is an unusual bird, stop quickly in the middle of the track and leave your car door wide open (this is important), and then walk off aimlessly looking for the mystery bird. Ultimately you want to repeat these steps as much as is respectfully possible. Lesson 2. If you want to take up another level of birding prowess – don’t forget to leave the car engine running, the handbrake up, and the car still in gear! Before talking about the birds, I thought I spend sometime writing about the great plants at Cocoparra and Binya. With over 450 species recorded, these are linked to different habitat types, each species varying according to soil type. Cocoparra is a series of ranges, with exposed rough exposed rocks. On the high ridges you’ll find Black Cypress-pine (Callitris endlicheri), Dwyer’s Mallee Gum (Eucalyptus dwyeri), Currawang (Acacia doratoxylon), Green Tea-Tree (Leptospermum trivalve), and there’s some heathland dominated by Broombush (Melaleuca uncinata), areas where it’s worth looking for Shy Heathwren. 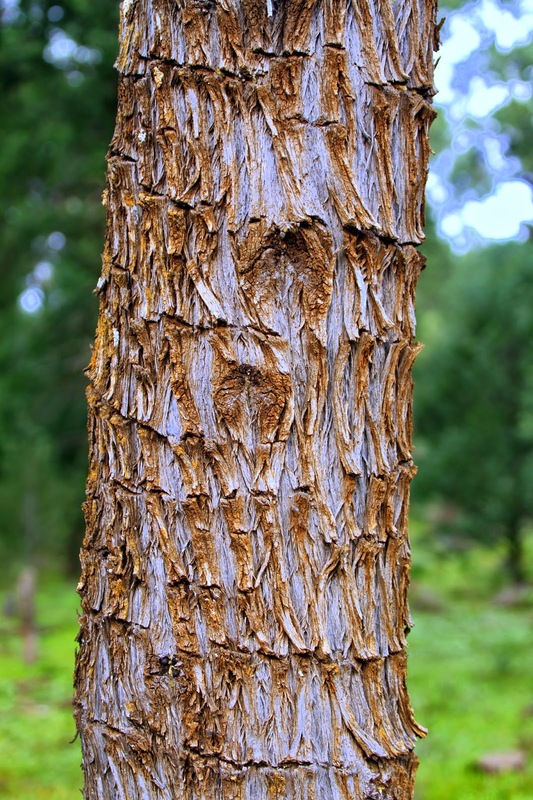 In the dry sclerophyll forest on the rising foot and midslopes you find native pines such as Black (Callitris endlicheri) and White Cypress-pine (C. glaucophylla) and Drooping She-oak (Allocasuarina verticillata). Eucalypts here include Dwyer’s Mallee Gum (Eucalyptus Dwyeri), Mugga Ironbark (E. sideroxylon), Red Stringybark (E. macrorhyncha), Grey Box (E. microcarpa) and the wonderful Bimble Box (E. ucalyptus populnea), with it’s glossy and rounded dark green leaves. This particular habitat mix is considered to be regionally endangered – with less than 10% remaining of its original extent – and is also the habitat type that supports locally endangered Glossy Black-Cockatoo (discussed below). Wattles on the slopes includes Currawang (Acacia doratoxylon), Yarran (A. homalophylla), Deane’s Wattle (A. deanei) and Boree (A. pendula), while other trees here include Kurrajong (Brachychiton populneum), Rosewood (Heterodendrum oleifolium) and Cherry Ballart (Exocarpos cupressiformis). When I visited Cocoparra just a few weeks ago the slopes were covered in Wonga Vine (Pandorea pandorana). A spectacular climber with large white-light red tube flowers about 15mm long, it’s a close relative of the Pandorea jasminoides and the other cultivars that are popular garden plants. At Cocoparra the flowers cascaded from the tops of shrubs and trees along the Mt Brogden walk. It seems to be a highly variable species, for instance in other places that I’ve seen them they’ve flowered in Spring, however here at Cocoparra this year they were flowering profusely mid-winter. The vines are quite thick, and as a result the wood was used in making spears for woomeras by Australian Aboriginals. 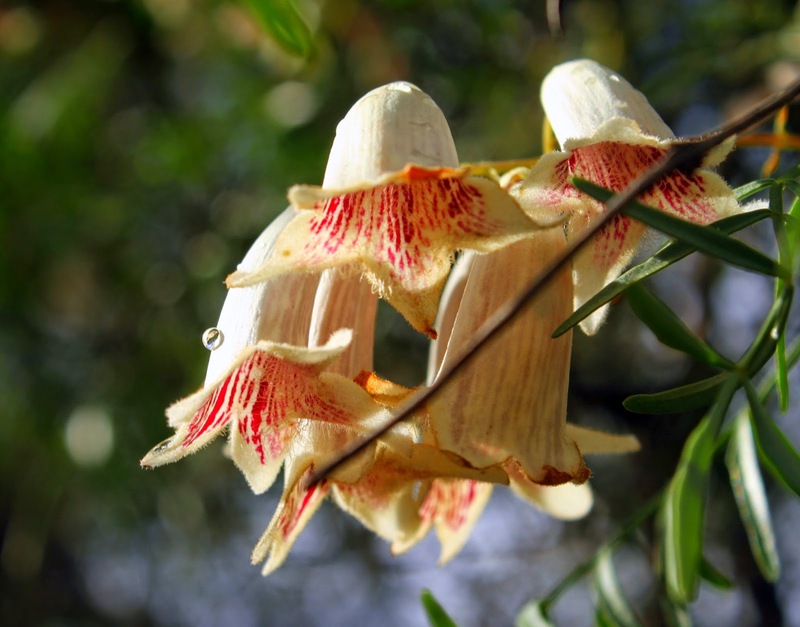 The spectacular Wonga Wonga Vine (Pandorea pandorana), flowering along Mt Brogden Walk and at Falcon Falls. Shrubs and Herbs Ground cover is normally sparse but after rain all the grasses and herbs come to life – look for Oval-leaf or Purple Mintbush (Prostanthera ovalifolia), Curry Bush (Cassinia laevis), Sticky Everlasting (Xerochrysum viscosum), Rusty Spider-Flower (Grevillea floribunda), Common Fringe-myrtle (Calytrix tetragona), Grey or Hoary Guinea-flower (Hibbertia obtusifolia), Erect Guinea-flower (Hibbertia riparia), Nodding Blue Lily (Stypandra glauca), Smooth Flax Lily (Dianella laevis), Urn Heath (Melichrus urceolatus), Australian Bluebell (Wahlenbergia stricta) and Sandhill Goodenia (Goodenia willisiana). Native daisies include Cut-leaved Daisy (Brachyscome multifida), Variable Daisy (B. ciliaris) and Showy Daisy (B. ciliocarpa), while the tussock grasses are Spear Grass (Austrostipa nodosa), Variable Spear Grass (Stipa variabilis) and Wallaby Grass (Danthonia linkii). There are a few rare plants occurring in the park. 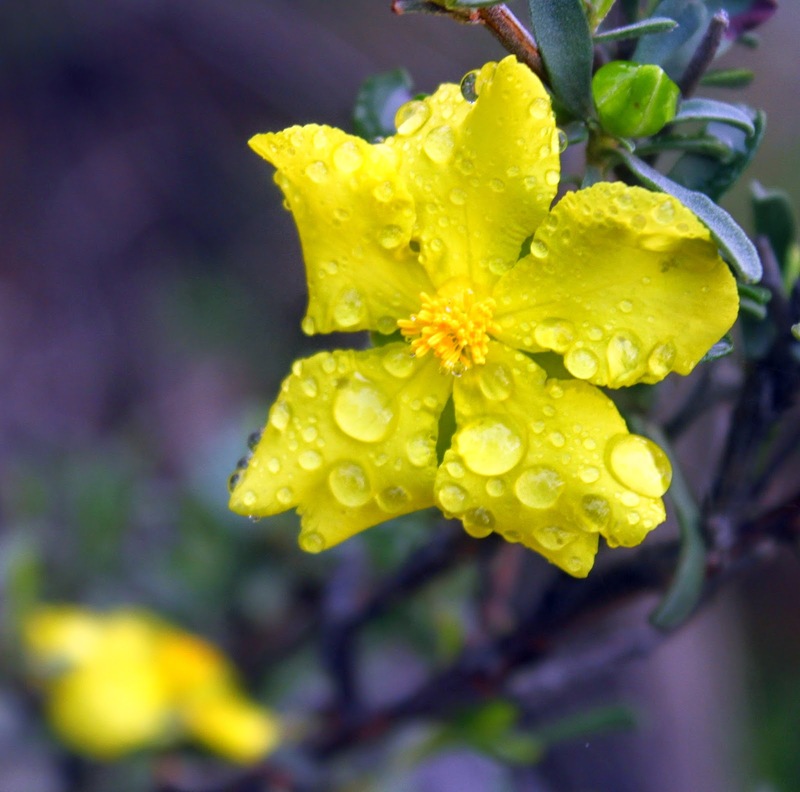 This includes Cocoparra Pomaderris (Pomaderris cocoparrana), which is confined to rocky higher altitudes areas in the Cocoparra Ranges – it’s easily recognised by its ovate leaves with a green upper surface and velvety, grey under surface, and a bright yellow flowers in spring. It was once thought to be the more widespread Pomaderris andromedifolia, until it was revealed to be distinct separate species. Other rare plants include Club-leafed or Dainty Phebalium (Phebalium obcordatum) and Irongrass (Lomandra patens). In terms of native mammals in the park, Cocoparra is a bit of refuge. I’ve seen Echidna (Tachyglossus aculeatus), both Eastern (Macropus giganteus) and Western Grey Kangaroo (M. fuliginosus), Red Kangaroo (M. rufus), Black (Swamp) Wallaby (Wallabia bicolor), while Red-necked Wallaby (M. rufrogriseus) have been recorded near Cocoparra but not in the park itself – probably the most westerly population for this species in the NSW. Smaller mammals in the park remain largely elusive. There are Brushtail Possum (Trichosurus vulpecula) and the diurnal Yellow-footed Antechinus (Antechinus flavipes), both relatively common. Most other small mammals are known only by their remains identified in owl pellets, such as Rattus sp., i.e. Bush Rat (Rattus fuscipes), Bandicoot (Isoodon sp.) and native mice (Pseudomys sp.). Eight species of bat have been recorded, the most common being the White-striped Mastiff bat (Tadarida australis) as well as the vulnerable Eastern Long-eared Bat (Nyctophilus timoriensis). Feral animals in the park include Cat, Fox, Goat (quite common, estimated numbers to be ~2000, I’ve seen them on virtually every walks I’ve done), Rabbit and I’ve seen signs of wild Pig. There is a variety of reptiles in the park, notably the Nobbi Dragon (Amphibolurus nobbi) and the Tree Crevice-skink or Tree Skink (Egernia striolata). Both occur in the rocky areas along the Mt Brogden walk. The Nobbi Dragon is similar to a Jacky Lizard (A. muricatus), but has a distinctive stripe along its backs which is often pale-coloured or even yellow, while the best place to look for Tree Skink is on the trunk of a large eucalypt that have peeling loose bark and is surrounded by piles of rocks, broken branches, dead leaves and some decaying hollow logs. Other reptiles include Bearded Dragon (Pogona barbatus), Lace Monitor (Varanus varius), Wood Gecko (Diplodactylus vittatus) and Mulga Snake (Pseudechis australis). 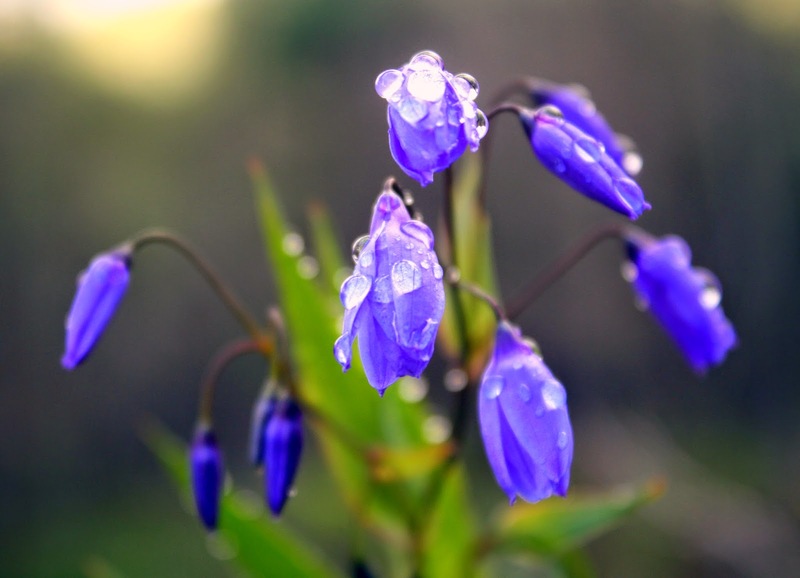 A wet winter. Red sandy soil covered with moss and lichen, along the Binya Forest Drive. Cocoparra and Binya were classified as an Important Bird Area by BirdLife International, mainly because it supports a relatively large populations of the near threatened Painted Honeyeater (the highest number of birds recorded at one site at one time was 22) and contains Diamond Firetail. While it always great to see these two species, Cocoparra has many other birding attractions. For instance you can target birds such as Glossy Black-Cockatoo, White-browed Treecreeper, Bar-shouldered Dove, Black-eared Cuckoo, Striped Honeyeater, Turquoise Parrot as well as the wonderful mallee parrots such as Australian Ringneck, Mulga Parrot and Blue Bonnet – here it’s the yellow-vented ssp. haematogaster. In “good years” Cocoparra attracts birds such as Cockatiel, Budgerigar, Major Mitchell’s Cockatoo, Crimson Chat and Black Honeyeater. It’s also always nice to see Splendid and Variegated Fairy-wren, nice raptors in the area include Spotted Harrier and Black and Peregrine Falcon and, at night, I’ve heard Spotted Nightjar. The roadside native pines along Burley Griffith Way and Whitton Stock Route Rd is a good place to look for White-browed Treecreeper. They are quite active while foraging on the rough trunks of Belah, Buloke and native pines – listen for their trilled, cricket-like chirrup call, especially during the breeding season. Along the Burley Griffith Way and Whitton Stock Route Road there are also scattered area of Bimble Box (Eucalyptus populnea) which tend to be covered in Dropping Mistletoe (Amyema pendula). In late spring and summer this is the place to look here for Painted Honeyeater – like the White-browed Treecreeper, there call is distinctive, a loud georgi – georgi. I’ve also seen Spotted Harrier alongside the Whitton Stock Route Road. The Forestry Hut is one of the least known birding site in Binya. It’s located on the southern side of the Burley Griffin Way, approx 200m east of the Whitton Stock Route intersection (-34.242500, 146.237778). Access is via Pine Drive, whch may be impassable in wet conditions, but you can easily walk in. This is another good spot to look for White-browed Treecreeper, and it can be a great birding spot generally, especially during spring flowering. This is the only area that I’ve see Crimson Chat and Black Honeyeater, and here I’ve also seen Hooded Robin, White-browed and Masked Woodswallow, Mulga Parrot, Blue Bonnet, and Variegated and Splendid Fairy-wren. Looking across to the Wattle Dam. 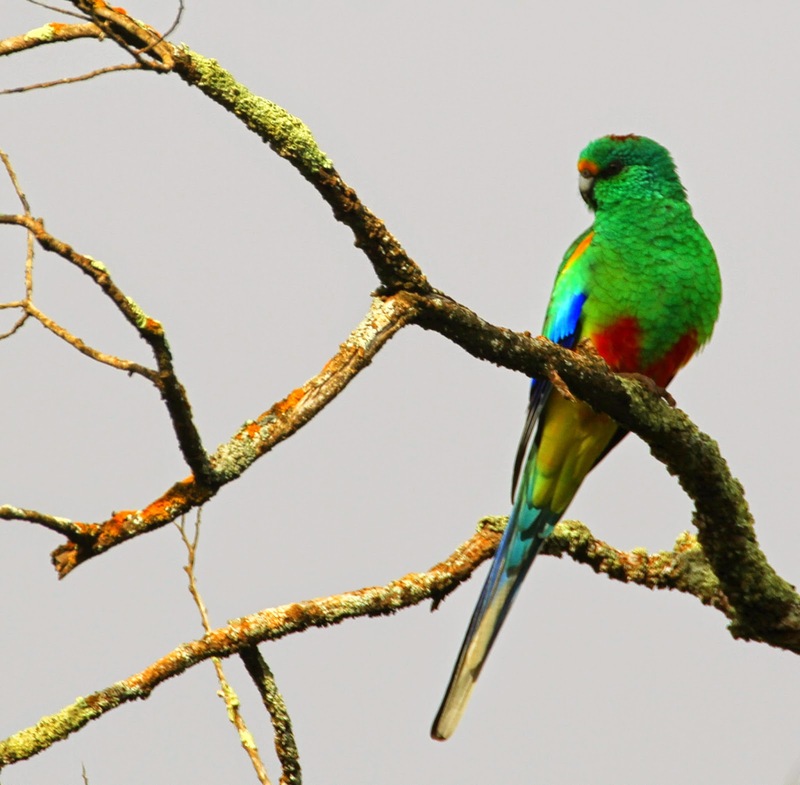 Cocoparra and Binya hold NSW’s most westerly populations of Turquoise Parrot. A good spot to look for them is around Wattle Dam and Moss Dam, particularly in the mornings. Both located off Barry Scenic Drive (an excellent 2WD road). Aside from the Turqs, around these dams you can also see Australian Ringneck, Mulga Parrot, Rainbow Bee-eater, Variegated and Splendid Fairy-wren, Spiny-cheeked and Striped Honeyeater, Inland, Chestnut-rumped and Yellow Thornbill, Western Gerygone, Varied Sittella, Apostlebird and Bar-shouldered Dove – the south-western-most population for this species. 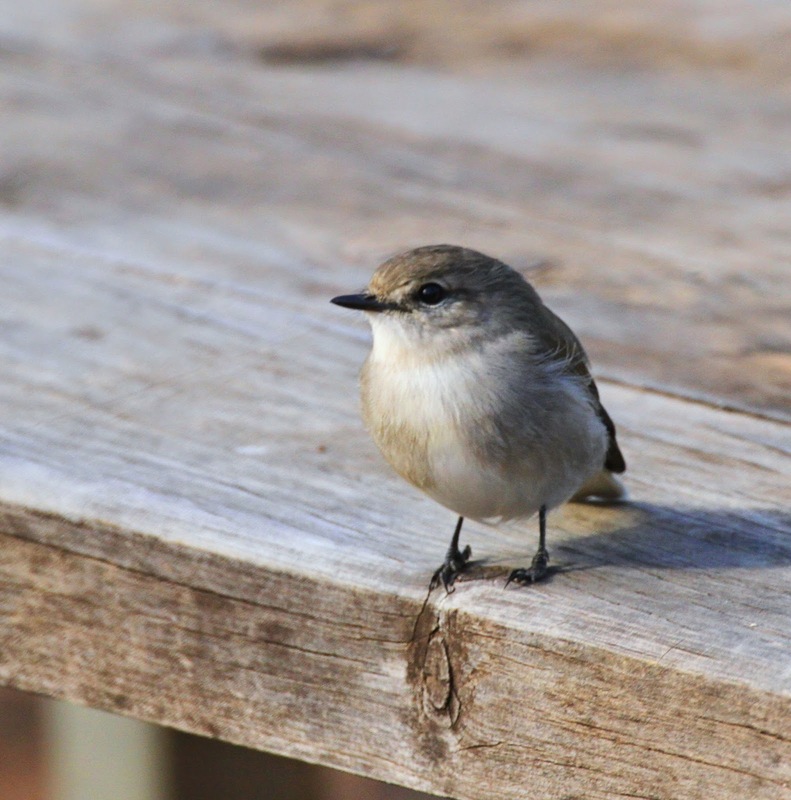 The Spring Hill Picnic Area can be teeming with birds, particularly when there are mixed-species flocks about. Here there’s a chance of seeing Turquoise Parrot, as well as Mulga Parrot, Mallee Ringneck, Brown Treecreeper, Grey-crowned Babbler, Striped and Spiny-cheeked Honeyeater, Speckled Warbler, Yellow and Chestnut-rumped Thornbill, Western Gerygone, Jacky Winter, Hooded Robin, Diamond Firetail and Double-barred Finch. From the picnic area take the walk to Falcon Falls, where the scenery is spectacular. These falls are appropriately named after the Peregrine Falcon, which breed on the cliffs in the area. Here too there are occasional sightings of Glossy Black-Cockatoo. 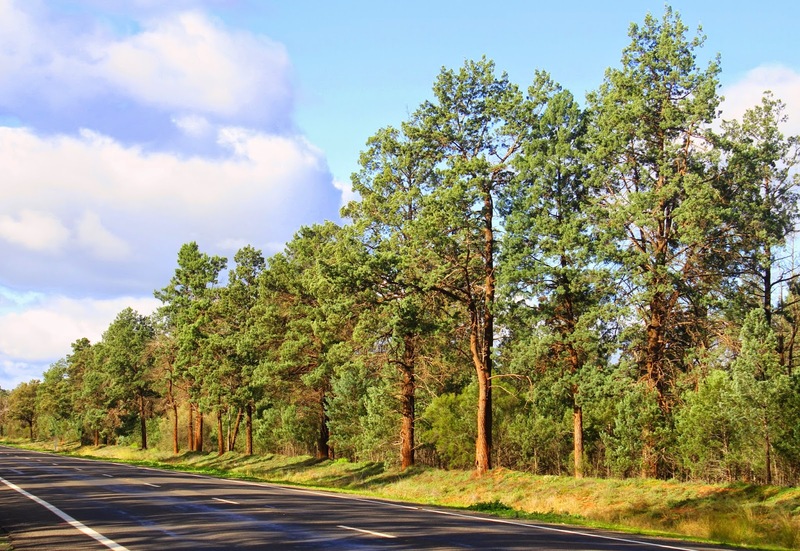 The habitat along the Binya Forest Drive is dominated by native pines – it’s worth stopping where ever you see birdlife. It’s particularly good for parrots such as Australian Ringneck, Blue Bonnet, and Turquoise, Mulga and Red-rumped Parrot. Along this drive I’ve also seen Striped Honeyeater, Speckled Warbler, Crested Bellbird, Splendid Fairy-wren, Brown and White-browed Treecreeper, Bar-shouldered Dove, and also heard Painted Honeyeater. This area is probably the best spot to look for Gilbert’s Whistler. Note: that the Binya Forest Dr may be impassable in wet conditions. Also note that the the Parakeet Drive connects the Binya Forest Dr and Barry Scenic Dr.
One of the best places to look for Glossy Black-Cockatoo is along the Mt Brogden walking track. This is the endangered Riverina population of Glossy Black-Cockatoo, birds that are largely restricted to hills and low ridges with areas of Drooping She-Oak (Allocasuarina verticillata). Glossy Black-Cockatoo then need suitable large hollows in Grey Box (Eucalyptus microcarpa) or Dwyer’s Gum (Eucalyptus dwyeri). Unfortunately much of this type of habitat has been cleared and is fragmented. The social and conservation context of the Glossy Black-Cockatoo in the Riverina intrigues me. 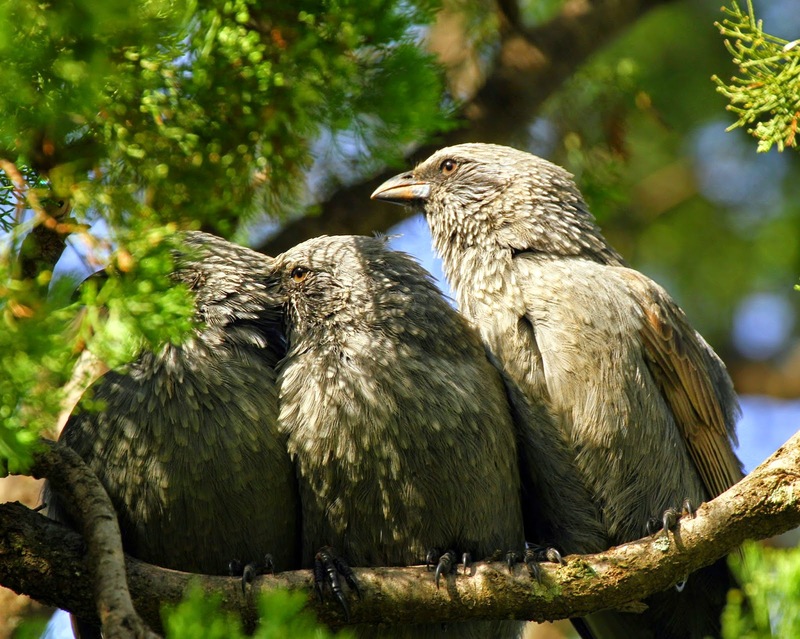 As a population they are disjunct from other Glossy Black-Cockatoo in NSW, and it now seems that the genetic link to the nearest easterly NSW birds is uncertain. Indeed there is some evidence that the Riverina birds are more closely related to the Kangaroo Island subspecies halmaturinus – only a mere 1000 km away – which is remarkable! The fact that the Riverina Glossy Black-Cockatoo are isolated and that they may be linked to the Kangaroo Island birds indicates that this population has a very significant conservation value. Mt Brogden is also one of the few spots in Cocoparra where Chestnut Quail-thrush have been recorded, which may be present in the park in small numbers – aside from that, the nearest population of Chestnut Quail-thrush is said to be Loughnan Nature Reserve near Hillston and the bird at Round Hill and Nombinnie. The Store Creek walking track begins at the picnic area and takes you through a nice section of Cypress Pine and Bimble Box. It ends at stunning natural amphitheatre formed by the junction of two creeks. It’s a good track to look for Crested Bellbird, Red-capped Robin, Speckled Warbler, Striped and Spiny-cheeked Honeyeater, Chestnut-rumped, Yellow and Inland Thornbill, Splendid Fairy-wren, Double-barred Finch and Diamond Firetail. In spring (a few years ago) I’ve seen Black-eared Cuckoo (heard), Masked and White-browed Woodswallow and Western Gerygone along this walk. I’ve seen similar birds along the equally spectacular Jack Creek walking track – it a vast gorge and the walk takes you through some gullies and exposed ridges to three lookouts that provide views of the gorge. One of the features of the Jack Creek is the White-winged Chough that nest above the picnic tables. There’s a very pleasant camping area at Woolshed Flat. Around the campsite and in the surrounding bush I’ve seen Emu, Mulga Parrot, Mallee Ringneck, Blue Bonnet, Spiny-cheeked, Striped, Yellow-plumed and Blue-faced Honeyeater, Noisy and Little Friarbird, Speckled Warbler, Southern Whiteface, Dusky Woodswallow, Restless Flycatcher, Pallid Cuckoo, Rainbow Bee-eater, White-winged Trilller, Western Gerygone, Restless Flycatcher, and Rufous Songlark, and thornills such as Inland, Chestnut-rumped, Yellow, and Yellow-rumped. I’ve not seen them, but there are occasional sightings of Major Mitchell’s Cockatoo around Woolshed. At night I’ve heard Spotted Nightjar, Australian Owlet-Nightjar, Southern Boobook, and Tawny Frogmouth – the frogmouth here are the central Australian/dry country ssp. brachypterus. A fantastic and very large Ramsar-listed wetland, Fivebough Wetland (400 ha) is a must visit place when passing through the area. With an impressive one hundred and eighty species recorded, including eighty waterbird species, you’d be stupid not to stop! Leeton has a range of accommodation options – but if you’re looking for somewhere interesting to stay, I’ve found that a particular good place is the Historic Hydro Motor Inn; despite the name, it’s actually a grand old motel. The restaurant at the Inn is called the Freckled Duck – and no, before you ask, duck wasn’t on the menu! The main car park is about 2 km north-east of Leeton’s town centre on Petersham Rd (-34.535624, 146.420576). It’s a surprisingly small car park for such a large reserve, so don’t blink or you’ll miss it. The birding around the car park, and the nearby planted section of gums, is surprisingly good – I’ve found Little Friarbird, Yellow-throated Miner, Singing and Spiny-cheeked Honeyeater, Chestnut-rumped and Yellow-rumped Thornbill, Weebill, Western Gerygone, Striated Pardalote and Zebra Finch. The 5 km of walking trails begin from the car park, and lead to a number of viewing mounds and two excellent bird hides. The track first takes you to along All Weather Walking Trail to the Bittern bird hide. Along the first section of reeds, I’ve occasionally seen Brown Quail feeding in the grassy fringes of the track. This bird hide overlooks a portion of wetland specifically managed for the relatively rare Australasian Bittern: in season, their presence may be revealed by their repeated booming call, heard mainly at night. There is also a chance of Australian Little Bittern. From the Bittern bird hide, and the nearby viewing area, you may also see Glossy Ibis, Magpie Goose, Brolga, Red-kneed and Black-fronted Dotterel, Black-winged Stilt, Red-necked Avocet and Black-tailed Native-hen. It’s always worth scanning the exposed muddy edges for Baillon’s, Australian Spotted and Spotless Crake. A range of summer shorebirds visit the wetland, such as Latham’s Snipe, Black-tailed Godwit, Common Greenshank, Wood, Marsh and Sharp-tailed Sandpiper, and Red-necked Stint, and look out for Whiskered and White-winged Black Tern, White throated Needletail and Fork-tailed Swift. Rarities recorded at the wetland include Little Curlew, Pectoral Sandpiper, Long-toed Stint and Oriental Pratincole. The known as Duck Pond (the shire council’s sewage ponds) are overlooked by a bird hide on the eastern side of Fivebough. This is a great spot for waterfowl such as Musk, Blue-billed, Freckled and Pink-eared Duck, Plumed Whistling-Duck and Australasian Shoveler. The Duck Pond at Fivebough Wetland. 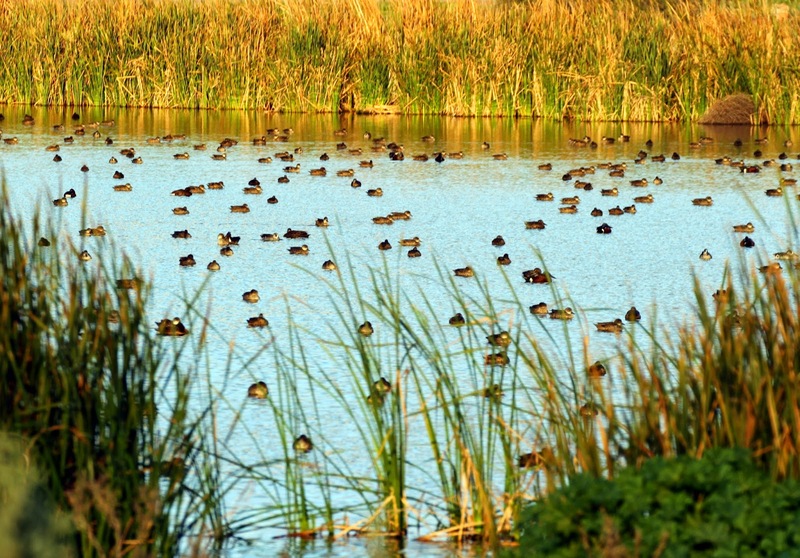 The ducks in this image include Freckled, Blue-billed, Pink-eared and Black Duck, Australasian Shoveler, and Grey and Chestnut Teal. Not bad! The Hooey Rd Lookout (-34.523651, 146.440815) is located on the other of Fivebough Swamp. The Lookout provides a nice vantage point to scan the wetland, with the best time for viewing at the end of the day, when large numbers of Glossy Ibis fly in to roost for the night. Numbers vary from year to year – the highest counts has been a staggering 20,000 in Nov 1995, and 15,000 in Nov 2005. Another wetland worth investigating in the area is Tuckerbil Wetland. It’s a large swamp north of Leeton. Situated in crop fields, it can be accessed via Cantrill Rd 12 km north-west of Leeton. Drive up Cantrill Rd until you find a picnic area adjacent an old sand quarry in a field. The quarry is good a place to see White-backed Swallow, Red-backed Kingfisher, Rainbow Bee-eater and Striated Pardalote – all have beeb known to nest in the quarry. When the swamp contains water, it attracs many of the birds found at Fivebough, while it’s also a good place to see Blue Bonnet and Cockatiel. Aside from Swamp Tuckerbil and Fivebough Wetlands, Campbells Swamp just north of Griffith (-34.229344, 146.031104) has some interesting birds – it’s a small shallow wetland, and has some nice areas of reeds and open water. There’s a good bird hide and boardwalk, and because of its small size, it’s possible to walk all the way around the swamp. There’s a good car park 1 km past the turn-off to Lake Wyangan. I’ve not seen them, but it’s a known site for Australian Little Bittern and Australasian Bittern – while Plumed Whistling-Duck, Freckled Duck, Magpie Goose, Baillon’s Crake, Australian Spotted Crake, Spotless Crake, Black-tailed Native-hen, and Red-kneed Dotterel have also been seen here. Like Fivebough, when the water level is right, thousands of Glossy Ibis may come to roost in the swamp each evening. And you occasionally get waders such as Wood, Pectoral and Marsh Sandpiper. An interesting walk is to cross the western fence of the swamp – or go around – into the crown land and then head to the old cattle yards. This minor land depression is edged with a single line of Bimble Box that act as an ephemeral flood depressions, and can be good for birds. BTW the Griffith Golf Course is one if the best sites in the region for Major Mitchell Cockatoo and Blue Bonnet are usually there. 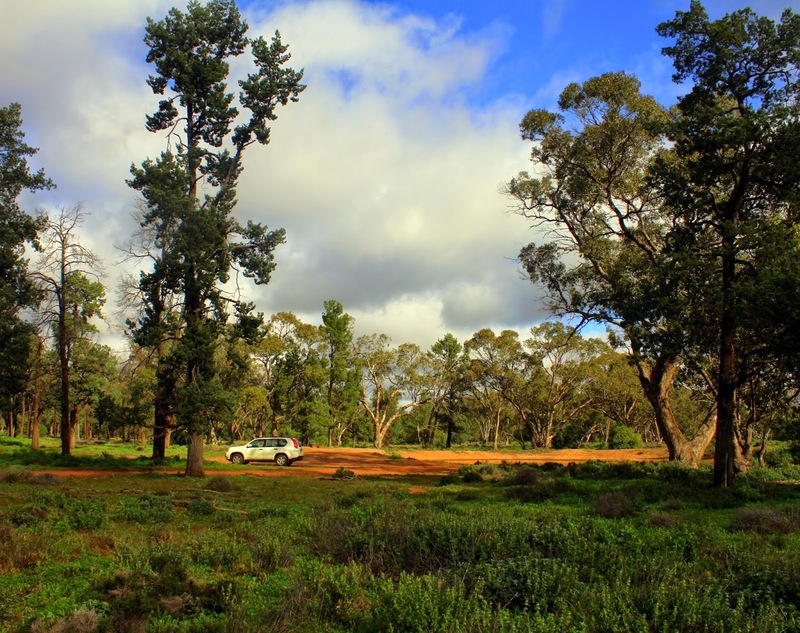 Pulletop (145 ha) is a really interesting remnant area of the mallee located north east of Cocoparra (35 km north of Griffith). It’s located just off the Rankins Springs Road. Turn west when you get to Pulletop Rd, and the reserve is about 4 km (-33.964751, 146.083791). It is worth noting that Pulletop Rd is a really just a sandy track – when I was there it was in need of a good grading – and it may be impassable after rain. 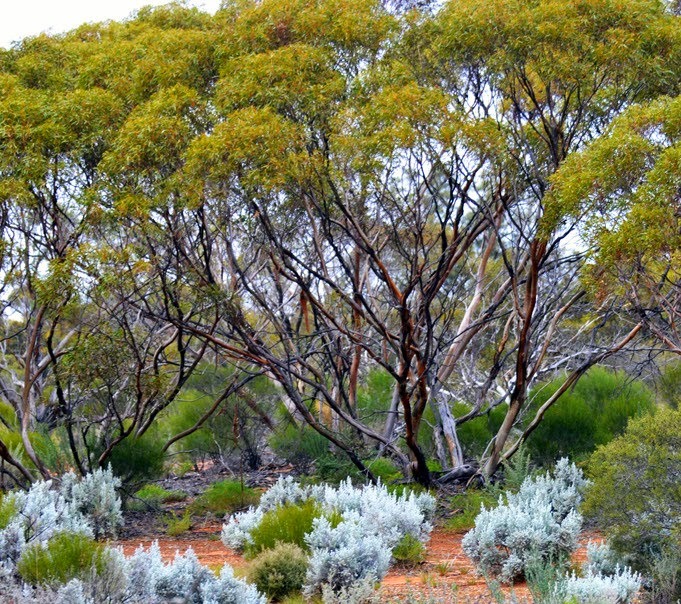 The reserve has four species of mallee, White (Eucalyptus dumosa), Narrow-leaf Red (E. leptophylla), Red Mallee (E. socialis) and Yorrell (E. gracilis). These species dominate the reserve. There are some patches of Broombush (Melaleuca uncinata) and Mallee Cypress-pine (Callitris verrucosa) that are intermixed with Streaked Wattle (Acacia lineata), Sweet Quandong (Santalum acuminatum), Fringed Heath-myrtle (Micromyrtus ciliata) and Wedge-leafed Hopbush (Dononea cuneata). There’s also a small area of Bimble Box (E. populnea) woodland in the south-west corner. Rare plants in the reserve include Club-leafed Phebalium (Phebalium obcordatum) and Rankins Springs Grevillea (Grevillea rosmarinifolia ssp glabella), so look out for those. And look for native orchids such as Dwarf Greenhood (Pterostylis nana) and the even smaller Midget Greenhood (P. mutica), Blue Fingers (Caladenia caerulea) and Pink Fingers (C. carnea). Due to this mallee mix, Pulletop is a great place to see parrots such as Major Mitchell’s Cockatoo, Cockatiel, Mallee Ringneck, Mulga Parrot, Budgerigar and Blue Bonnet. It’s also excellent for honeyeaters, such as Yellow-plumed, White-fronted, Black, Singing, Painted Brown-headed, Spiny-cheeked, Striped, White-eared and White-plumed Honeyeater, Yellow-throated Miner and Crimson Chat – now that’s not a bad list! You can also see Peaceful Dove, Hooded Robin, Masked and White-browed Woodswallow, Crested Bellbird, Varied Trilller, Rufous Songlark and Variegated and Splendid Fairy-wren. With great misfortunate, however, a few birds have gone missing from Pulletop. Malleefowl and Red-lored Whistler were last seen in the mid-1980s and are now considered extinct. The reserve was retained because it was felt that this was a sufficient area to retain a viable population of these species, which unfortunately does not seem to be the case. It’s a real pity, for instance Graeme Chapman photographed NSW’s first ever record of Red-lored Whistler here in 1964. There’s an old hut in the reserve. which has been rarely used since the late 1980s when the last Malleefowl disappeared. Malleefowl used to be a regular attraction for birders and the hut was used for these trips. Harry Frith did much of his pioneering work on Malleefowl around this hut, and there’s still an intact Malleefowl mound nearby. The hut is therefore an interesting archaeological birdwatching site, very significant and worth preserving. Unfortunately a number of other mallee species have declined and may have become locally extinct. These include Shy Heathwren (only one record since the late 1990s), Chestnut Quail-thrush (only a few recent records), Southern Scrub-robin (last record 1982) and Gilbert’s Whistler (last record 1982). So, when you do visit Pulletop, keep your eyes open, and your fingers crossed, and hopefully you see these bird species. Quite apart from the the birds, another good reason for visiting Pulletop is to simply immerse yourself in some wonderful mallee habitat – one of my favourite places to be! 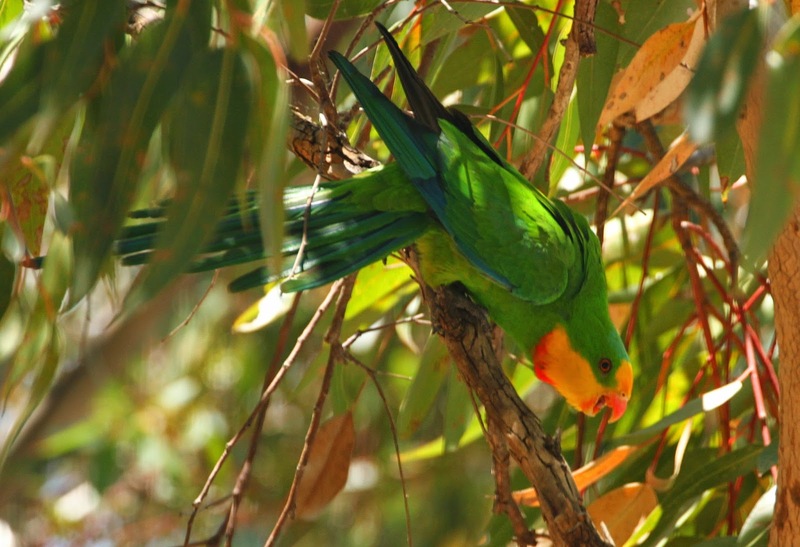 In spring and summer Leeton is a great place to find Superb Parrot. I’ve seen them there at a number of spots: one was in roadside trees along Irrigation Way (-34.643565, 146.415968) about 11 km from Leeton; another is in the Yanco Agricultural Institute (-34.617190, 146.423197) that located on Truck Rd – this was the place where the Australian Birdfair was held. Crimson Rosella (‘Yellow Rosella’ ssp. flaveolus) is also common around here. Another great place to see Superb Parrot is at Charles Sturt University in Wagga Wagga, with best times to see them between August to December. Look for them coming into drink at a small dam near car park 7 (-35.062440, 147.355528), and they also like to feed in a paddock adjoining Nathan Cobb Drive (-35.056824, 147.354327). Other places that Superb Parrot occur (mainly between August to December) include the Berry Jerry section of Murrumbidgee Valley National Park, with a nice spot to look for them is here -35.046041, 147.037321. Access is via the roadside pull-in on the Sturt Hwy between Wagga Wagga and Narrandera. I’ve also seen them regularly at a couple of sites along the Olympic Hwy, such as the Wallacetown Roadside Rest Area (-34.959565, 147.447136), and a small area of bushland here (-35.006376, 147.421253). Australian Spotted Crake, Junee Wetland. The Junee Wetland (-34.868043, 147.579299) is a small wetland in the middle of downtown Junee. 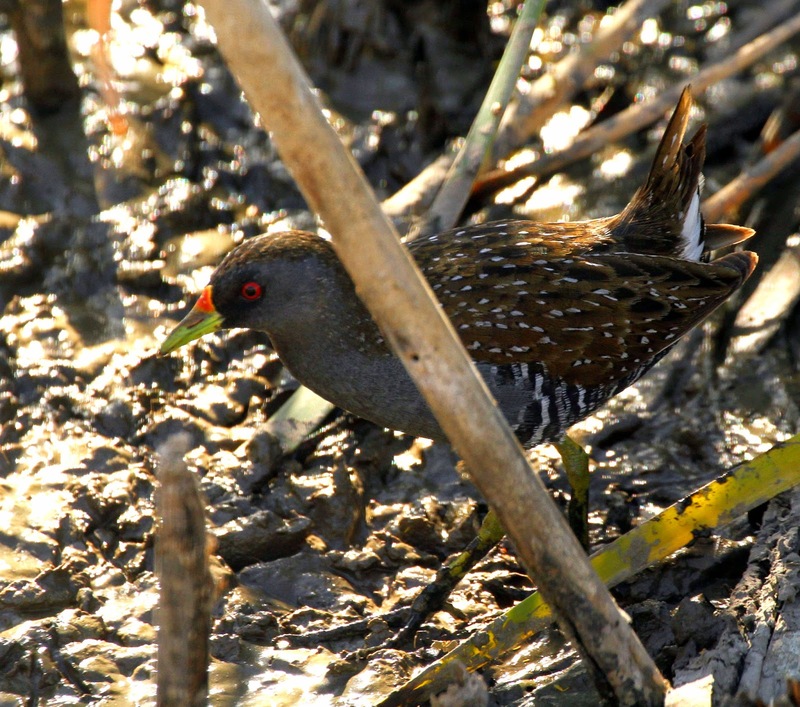 It is, however, paradise for crake and rails – so, if you are passing through it is really worth stopping to have a look. It receives 75% of the town’s stormwater runoff, as a consequence, contain water even in the hotest time of year. There’s an excellent boardwalk that enables you to get up close and personal with Australian Spotted, Spotless and Baillon’s Crake and Buff-banded Rail. Another bird I’ve seen here is Brown Honeyeater, pretty much the most southern limit for this species. In summer the Junee Wetland can also be good for migratory waders, particularly Latham’s Snipe. Galore Hill is 80 km south-east of Leeton. It’s a new site for me. The first time I’d been there was just a couple of week ago (June 2014), however I was so impressed by the place that I wanted to write about it. I think it’s a special find! It’s an impressive reserve that preserve about 500 ha of bushland – accessed via the Narrandera Rd, it’s between Narrandera and Lockhart. There’s a lookout tower on the summit that offer fantastic panoramic views of the region. Galore Hill is probably most famous as being the place where the bushranger Daniel ‘Mad Dog’ Morgan hung out in the caves of the park. The first stop is actually before entering the reserve, at the intersection of Slocums Lane and Tinamba Lane (-35.115589, 146.759016). This is a good spot to see Apostlebird and Grey-crowned Babbler, which occur in the native pines along the roads here. Second stop is the arboretum, one of the reasons I was so impressed by Galore Hill. An arboretum is a botanical garden that’s focuses on growing ‘special’ plants. They can be great places to see birds, attracted to a wide variety of flowering plants. A good example of this is the arboretum at Dryandra Forest (south-west WA). 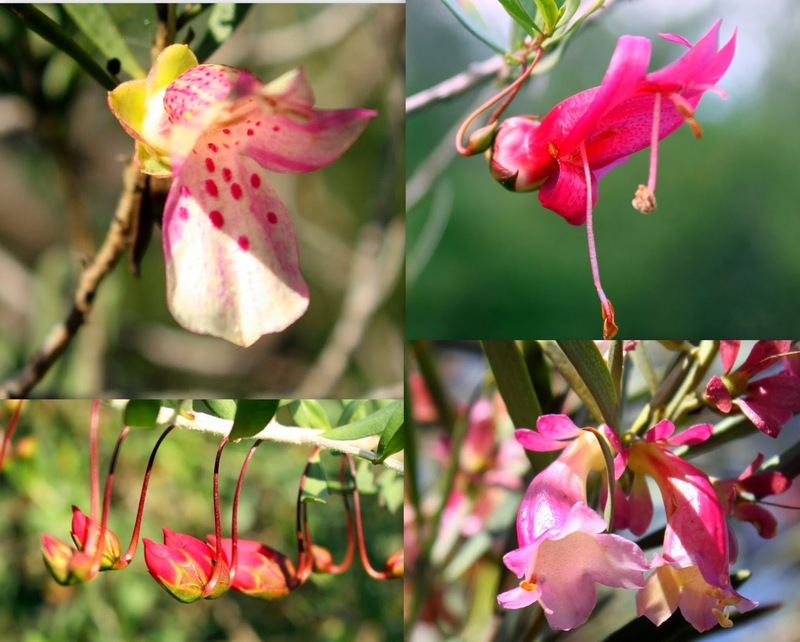 So what if I tell you that the ‘special plants’ in the Galore Hill arboretum were Eremophila, Grevillea, Hakea and Acacia! It was like stumbling across bird heaven. I was blown away by the number of flowering plants, all bird attracting. As a result Galore Hill has a pretty good bird list, including the two rare nomads, Black and Pied Honeyeater! 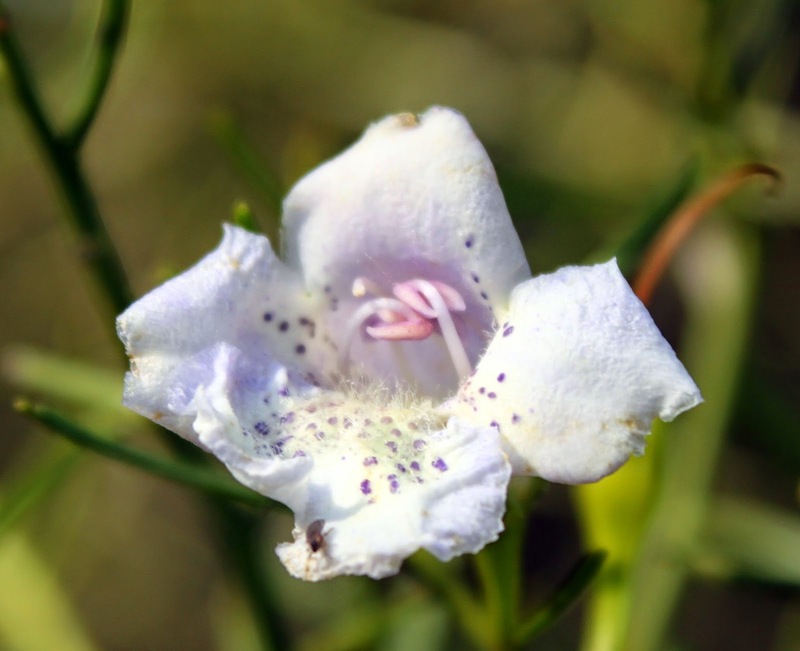 So, second stop is the patch of Eremophila that’s located immediately after you enter the park. 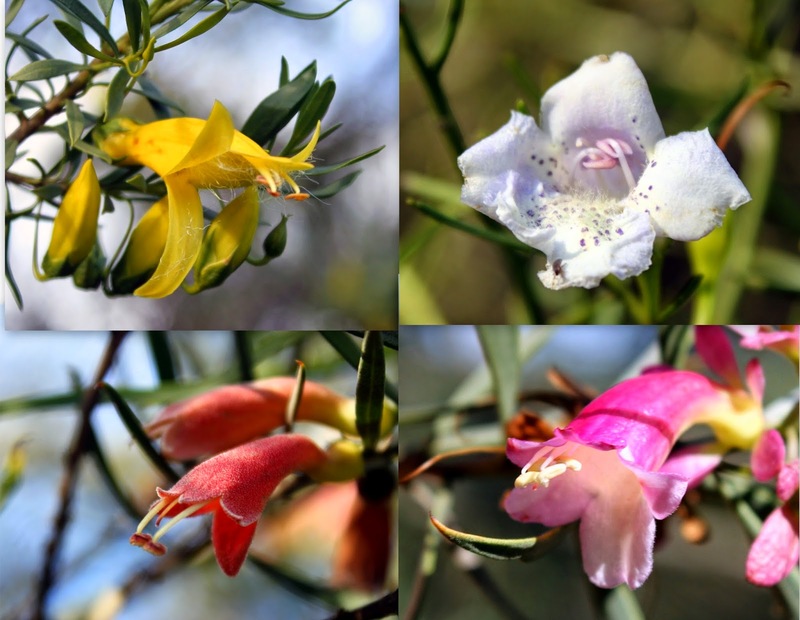 I visited in the middle of winter, despite this, almost half the species of Eremophila were flowering. Look for honeyeaters such as Brown-headed, Fuscous, White-napped, Spiny-cheeked, White-plumed Honeyeater, and, if you are lucky, you might find Black and Pied Honeyeater! After stopping at the Eremophila patch, it’s worth driving along both the Curly Heckendorf Drive and the Summit Track, stopping where ever you see or hear bird activity. Along the Summit Track, Grey Box dominant the lower areas, while and Dwyer’s Red Gum, Black Cypress-Pine and Drooping Sheoke occur on the upper slopes and ridges. In these areas you might see Emu, White-throated and Brown Treecreeper, Restless Flycatcher, Varied Siytella, Rufous Songlark, Dusky, White-browed and Masked Woodswallow, Variegated Fairy-wren, Diamond Firetail and Double-barred Finch. The park’s really good for robins; while there I saw Hooded, Red-capped, Scarlet, Flame and Eastern Yellow Robin and Jacky Winter! 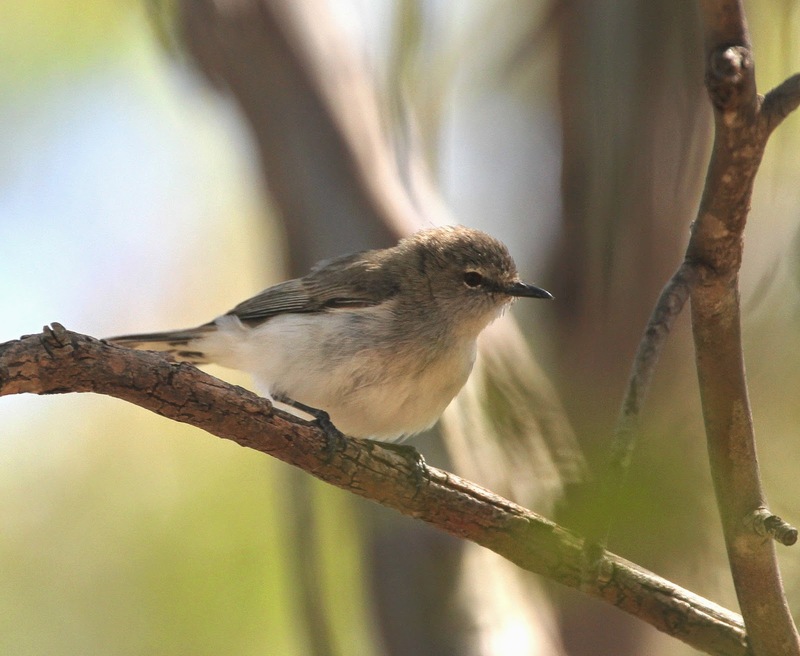 In terms of Thornbills and their allies there are Speckled Warbler, Weebill Brown, Inland, Chestnut-rumped, Buff-rumped, Yellow and Yellow-rumped Thornbill, Western Gerygone, and Southern Whiteface! Parrot recorded at Galore Hill include Australian Ringneck, Budgerigar, Cockatiel, Superb and Red-rumped Parrot, Eastern and Crimson Rosella and Swift Parrot have also been recorded. Interestingly the main reason I visited Galore Hill in the first place was to look for Glossy Black Cockatoo. Again, like at Cocoparra, unfortunately I dipped. A panorama from the lookout at Galore Hill – “There’s land enough and galore for me!” said early settler Henry Osborne. Lists like that are simply priceless! 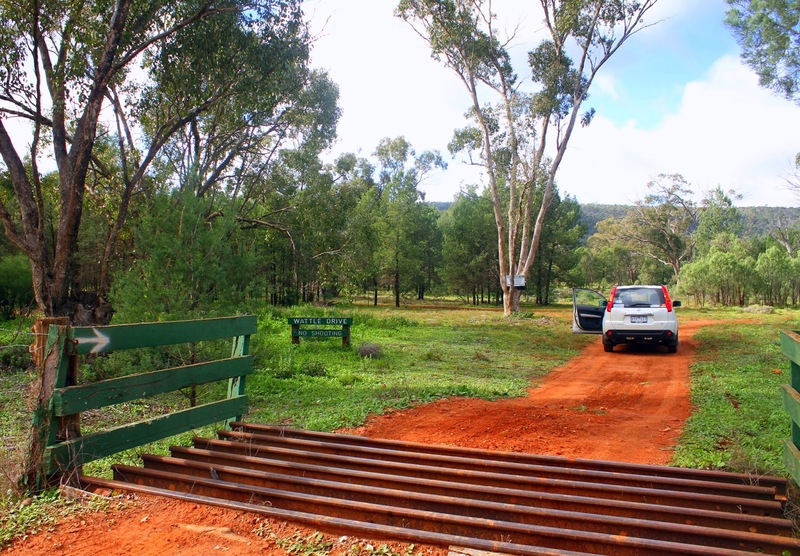 ← Chiltern Winter 2013 – Australia’s best winter forest? Being from the northern rivers area, most of the different species down south would be exciting to spot – even if I have seen them before. And of all the birds I would really love to see again in the wild are the Budgies (have seen them near Tibooburra but did not have a good enough camera back then) and from your account, it would seem there is a bit of a chance. Great work on such an informative site.